This issue had me quite puzzled. A customer was running Microsoft Outlook 2007 on a Windows 7 Professional computer. 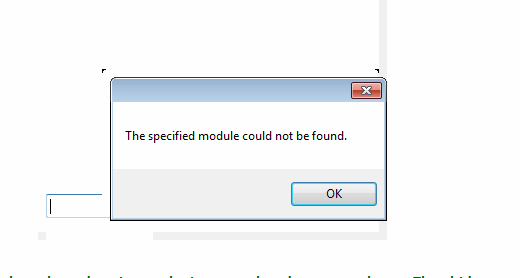 The client told me whenever she would try to attach a file, in Outlook, she would get the following error. I had never seen this issue before. Here are some of the troubleshooting steps I went through. I thought it could be a virus or malware issue so I ran a scan till I knew that wasn’t the issue. I disable all the add-ins in Outlook that would affect performance, no difference. I created a new Outlook profile, same deal. I repaired Microsoft Office, didn’t fix the issue. I decided to try disconnecting the mapped network drive. I disconnected the mapped network drive. I clicked “attach file” and it opened Windows Explorer without an issue. I went into the local documents and attached a file just fine. This confirmed in my mind that their had to be an issue between Outlook 2007 and the mapped network drive. I mapped the drive again and boom same error message and Outlook crashed as well. I disconnected the network drive (R:\\sbs\folder1) and this time I mapped a different network folder (R:\\sbs\folder2). I clicked, attach file and this time I got no error message and Outlook didn’t crash! Now I was confused, one mapped network folder drive worked the other one didn’t. I tried accessing both network folders through Windows Explorer,(without going through Outlook). I could access both folders just fine. I was pretty much at wit’s end. I called one of my colleagues about the issue. He found a .TVP file on the root of folder one. He removed the .TVP file. He then went into Outlook 2007 and tried attaching a file from that location. It worked. We copied the .TVP file back into that folder and the error came back and Outlook froze. Resolution: We took that .TVP file off the base of that folder and everything was back to normal!! Some of the most difficult and irritating problems have such a simple fix. I believe this was probably a freak issue. Apparently, their was a file association issue that was creating that error message and then Outlook would freeze and crash. Special thanks to Kirby for helping me . This entry was posted in Troubleshooting and tagged .TVP file, Outlook, Outlook 2007 on March 19, 2014 by Merlin Halteman. Recently, I upgraded a user from Outlook 2007 to Outlook 2013. They used Microsoft’s Office 365 exchange service for their email. I set up the account without much of an issue until I got to the autocomplete file. Outlook 2007 stored the autocomplete file as an .NK2 file. Outlook 2013 saves the autocomplete file in a Stream_Autocomplete_***** .DAT file. When you start Microsoft Outlook 2013 for the first time it will try to automatically import your profilename.nk2 file into the new file format. In my situation it didn’t work correctly. It had imported a couple autocomplete files across but not nearly all of them. Here is how I manually imported the .NK2 file from Outlook 2007 into the new Outlook 2013 .Dat file. Step One: Make sure your .nk2 file is in the following folder: %appdata%\Microsoft\Outlook. Make sure the .nk2 file doesn’t have a .old file (profilename.nk2.old) extension after it. If it has the .old file extension after it delete it. Click on the Start Menu > Control Panel then click on User Accounts> Mail > Show Profiles. If they match you are ready to go to the next step. If your autocomplete file doesn’t match the name of your profile simply rename it to your current profile name. Step Three: Click the Start button and then click Run. Step Four: In the open box, type the following command: outlook.exe /importnk2 and then click OK. This should import the .nk2 file into the Outlook 2013 profile. I then opened Outlook and all of the autocomplete addresses and contacts were there! I hope this works for you as well. This entry was posted in Tips, Troubleshooting and tagged Autocomplete, Outlook, Outlook 2007, Outlook 2013 on January 16, 2014 by Merlin Halteman. Recently, we did a new server install for a customer. When I joined the computers to the new domain I had to make new user accounts. I normally run Windows Easy Transfer on the old profile and then transfer the information to the new one. Windows Easy Transfer will generally grab the email profile. However, the one laptop we joined to the domain had Windows Vista for its operating system. Windows Vista has a built in Windows Easy Transfer tool but we found it to be rather “clunky”. Our customer was using Office 365 exchange for their email so we could have left it redownload all the emails, but it would have taken to long and would have been inefficient. Here is how I transferred the profile and AutoComplete file to the new Windows profile. They were running Microsoft Office 2007 so I went into the location where the data file was stored. The path for the data file in Windows Vista is C:\Users\<username>\AppData\Local\Microsoft\Outlook . I copied the “Outlook.ost” to a flash drive. This entry was posted in Tips and tagged Autocomplete, Outlook, Windows Vista on January 10, 2014 by Merlin Halteman. How many times do you find yourself scratching your head because you forgot your email password? Or how about when you are setting up an email account for a friend or customer and they don’t remember what it is? Go to your Control Panel> User Accounts>Mail > Show Profiles. Select the profile you want. Then select Properties. Click on the email address that you need the password from and then select change. You should now be at the screen that shows your email account information including your password (with asterisks). Keep that window open. This entry was posted in Tips and tagged asterisk key, Email, Outlook, passwords on August 29, 2013 by Merlin Halteman.